Five Expansion Sets in One - 165 New Cards! Politics & Intrigue: In this theme your secret plans bear fruit! Can you seize control through diplomatic channels? Or should you ally with the Church and excommunicate your foe? Don't worry about his army, a few coins and his knights will be yours! Science & Progress: Technology and invention are the keys to the future! Will you embrace the future, building a University to train your brightest? Will amazing inventions guide you to victory? The thunderous roar of the cannon signals the end of the age of the knights! Wizards & Dragons: Magic bursts into Catan with this theme! Mighty wizards with potent spells can change the ace of the land itself! Can you withstand their awesome power? Will your armies flee before the might of the dragons? Will the fates favor your, or your foe? All of this and more can be found within! Two styles of play make this Catan experience different from any other! Share a theme with your opponent, or design your own deck of Expansion cards and confront a clever opponent with their own! 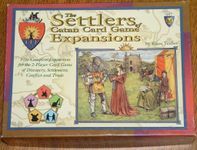 The choice is yours with the Settlers of Catan Card Game Expansion!